Coming up with baby gift ideas – even gifts for infants – is hard! I think we all understand that babies don’t want or really need anything, but I totally get that people really want to recognize special occasions. It’s a puppet, it’s a bath mitt, it’s something awesome to chew on! It’s a great baby gift idea. Shop here. 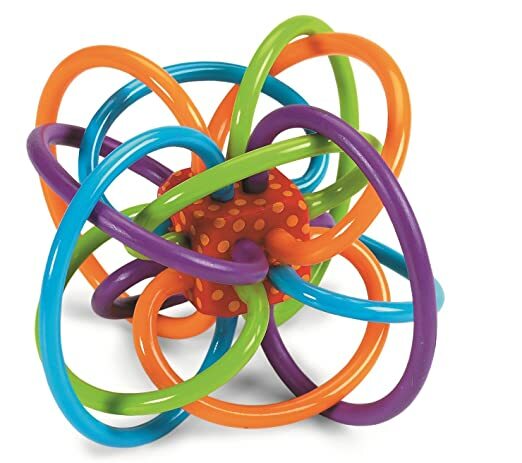 pipSquigz Loops may look like a randomly-shaped piece of silicone, but we all know that’s what babies like best. 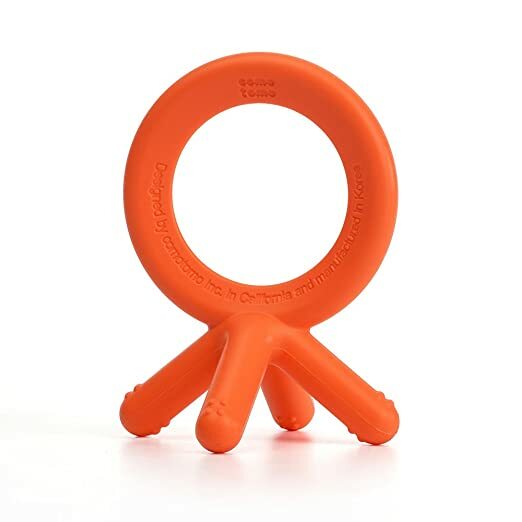 It has different textures, rattle rings, and a variety of places to grab and chew. Plus, it suction cups onto the table, which helps eliminate the “throw this down so mom has to pick it up” game. Shop here. This is an amazing car seat cover that keeps your baby toasty and warm but is also safe to use (it goes over the baby, not behind) Shop here. These are fun little instruments to spark your future musician. Shop here. This is a super popular walker that gets amazing ratings. Shop here. 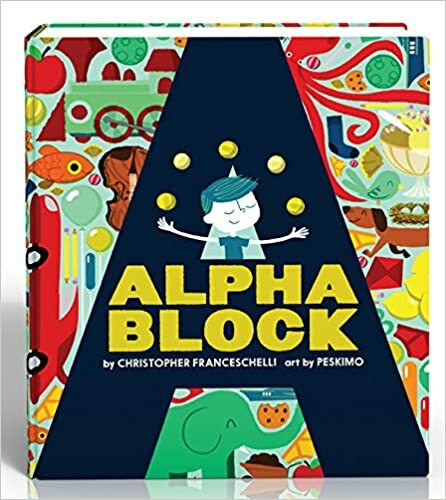 This is an amazing first game for kids. Simply roll the cube and choose the matching color card and perform the simple activity shown, such as “Make a happy face”, “Moo like a cow” or “Find something blue”. It’s fun and easy and something you can do together. Shop here. Kids love things they can sit on and rock. This sturdy, little pony is easy to climb on and converts to a spring horse when your child is done rockin’ Shop here. If your child doesn’t have an Oball, snap one of these suckers up. They rattle, are easy to grip and whip around with little damage if you take it in the face. Kids love ’em. Shop here. IKEA has the most lovely play food. Shop here. Who doesn’t love a camping theme?! 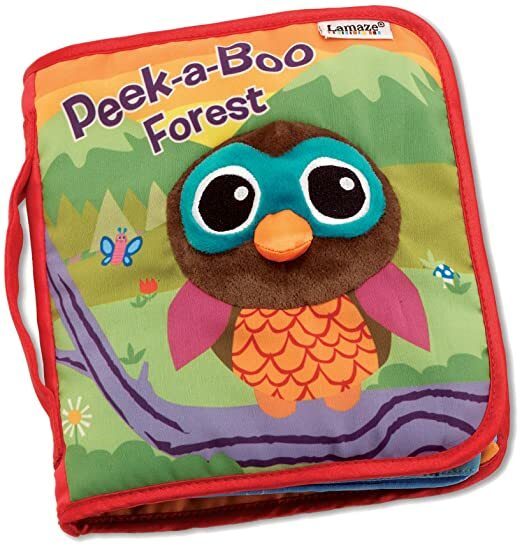 Includes a light-up firefly, turtle mirror, bear rattle and musical raccoon with wooden teether that plays “Twinkle, Twinkle Little Star” Shop here. Boon Pipes Water Pipes Shop here. Boon Marco Light-Up Shop here. Boon Water Bugs Shop here. Okay, Scout is awesome. Scout can learn your child’s name and favorite things for personalized learning in 15+ activities. Plus, Scout has 40+ learning songs, melodies, and lullabies. If only Scout could put away laundry. Shop here. Even if you’re not in water play weather, you will be soon enough and this is a real winner. I love that it’s not too big so you can move it into the shade and dump it at the end of the day so it doesn’t grow sea monkeys. Shop here. 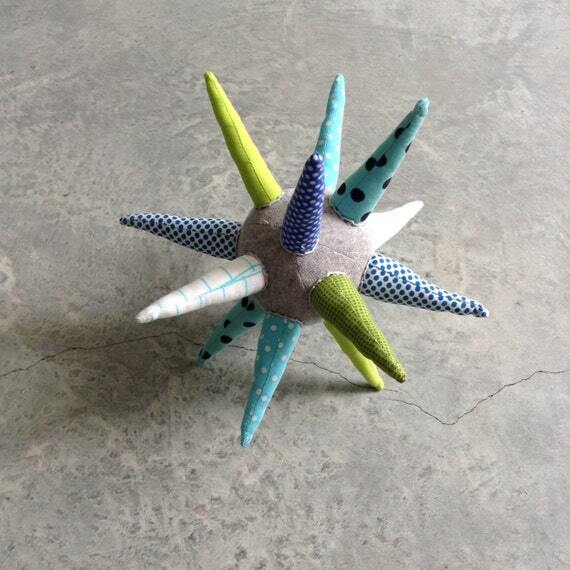 Nothing beats hours (okay minutes) of fun like a cause and effect toy. This one is sturdy and the doors are less likely to fail causing a kid-meltdown. It’s been around for a while and it’s a tried and true toy. Shop here. Kids are freakishly amazing at memory games (probably because they aren’t burdened with 20 years of t.v. jingles) so these make a really lovely gift to remember all the special people in their lives. Shop here. These have a ton of play value. There are shapes at the bottom of each egg that fits in the bottom. Kids can match the top of the shell to the bottom and they squeak. These will drive you crazy but kids love them. Shop here. Depending on the age of your child, this may be jumping the gun, but these little cars are fantastic when you have a blossoming walker that doesn’t dig the stroller. It’s easy to get in and out of and kids love catching this ride to the park. Shop here. You may feel like a mirror is just ‘meh’ but you know who else thinks your baby is the cutest, most interesting person on the planet? Yep, your baby. It does a whole bunch of cognitive stuff but, most importantly, it keeps your baby interested. Shop here. I saw this at a Baby Show and even I was totally mesmerized by it. Each time you add a gear to the spool it gently spins down. It’s easy to thread so there’s no frustration factor too. It’s a winner. Shop here. Not only do wagons come in handy for carting kids around, they come in handy for carting crap around too. Shop here. 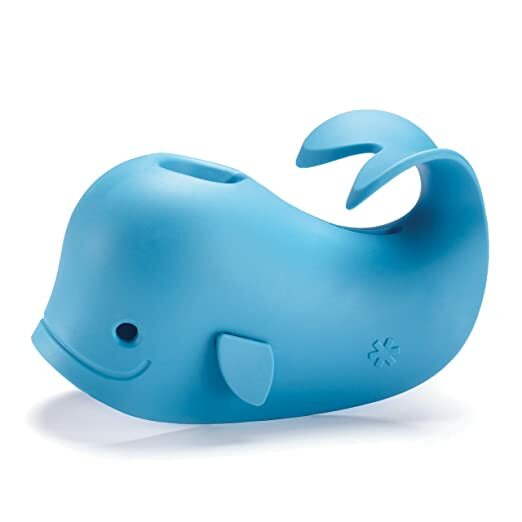 This sweet elephant can hold toys, pacifiers, and whatever else your kid can’t live without at the moment. Shop here. These are great for home, the bath, the beach, you name it. The stack and nest and one even has holes for water. Shop here. These are inexpensive and tons of fun. Babies love the feel of them, plus, they are safe to chew on. Shop here. LeapFrog does an excellent job of figuring out what kids love. This little musical table is no exception. Shop here. Dolls like this are great because they are loved and used for a long time so you get a ton of play out of them. Shop here. Hey, ya need a place to put all this stuff. Shop here. These guys convert any cup or glass into a sippy cup. It’s a handy thing to have on the go and it makes a great gift for a baby. Shop here. 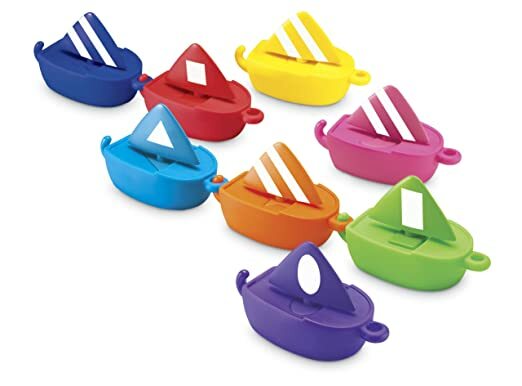 These are easy to clean and hard to throw so mealtime stays fun for everyone. Shop here. I fully recognize that this looks like a torture device (I felt the same way when I saw it) but this thing is magic and babies LOVE it and so do parents. You can use it in the tub or a pool too. Shop here. My kids each got a personalized bag like this and I use it all the time. I’ve used it for toys, extra clothes for preschool, and overnighters. Be sure to get the zip top so it doesn’t tip over and you have little socks everywhere. LL Bean also makes one so be sure to check them out to compare styles. Shop here. Especially great for keeping track of jackets, hats and sippies at daycare (or at the park). Shop here. These little chairs have a long shelf life. My kids read, played and even slept in them. My husband is actually sitting in one right now playing a video game — I kid you not. Shop here. When in doubt give diapers. Try to shoot for the next size up. Shop here. Today’s infant toy storage can become tomorrow’s Lego storage. Shop here. These are awesome. It’s a cold compress you keep in the freezer. It gets nice and cold but not “ouchy cold”, you know what I mean? Shop here. Swaddles are a fail safe baby gift. They have a million uses and aden + anais are the favorites out there. Shop here. These are fun and heaven knows organizing baby clothes is a damn nightmare. Shop here. Swim diapers are an awesome alternative to disposables. No one wants a pool “fouling” Shop here. These adorable bows and headbands are built to stay put on even the baldest of baby heads. You can check our review, and buy them on Amazon. These come in little mary janes, ballet slippers, etc. They are beyond adorable. Shop here. These are the best damn baby boots. They are warm. They never come off and they cover up the bare spot between the top of your socks and the bottom of your pants. They are also great for indoor slippers. Shop here. Any baby that needs to transition out of swaddling will love this little sleep suit because it’s heavy enough to muffle their reflexive startles that tend to wake them up. Shop here. My kids have these and they love them. It’s amazing what a name on a blanket or towel will do. Shop here. Baby Bear Bunting. There’s nothing else to say. Shop here. These guys really do make gorgeous sleepers and pajamas. Shop here. Lightweight, durable, and perfect for towing around their favorite toys. Shop here. Part-teether, part-puzzle, the OombeeCube is a durable, multi-textured toy that can keep your tot entertained while they chew, squish, and problem solve. As a bonus, the puzzle pieces don’t come off, making it a perfect toy to bring to a restaurant without worrying about anything dropping on the floor. Shop here. There is no way to adequately express how much joy these little dolphins bring me. You pop ’em in the tub, bop them gently on the head, and they let out a joyful little whistle. Each one makes a different pitch, which adds to the magic. Shop here. These are ridiculously beautiful in person. 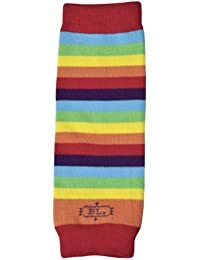 An absolute WOW gift if you’re looking to knock the compression socks off someone who appreciates a gorgeous pattern. Shop here. Cool handmade teether. It’s like a little baby weapon! Since it’s Etsy, the style changes up, but the idea stays the same. Shop here. This book has thick lettercut pages that are cut to the shape of each letter. It is so cool and has amazing illustrations. Shop here. I don’t know. I just think we all need a personalized crown. Shop here. These are just so lovely. Shop here. Earth Mama has some of the best stuff out there and this little gift pack contains shampoo, body wash, bottom balm, lotion and baby oil. Shop here. 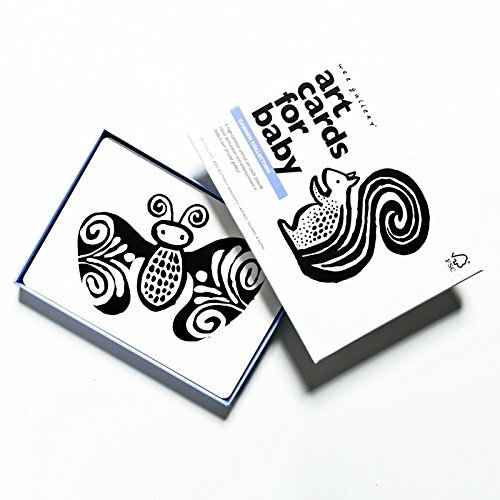 High contrast art cards not only appeal to babies, but would also make really cool nursery decor. Shop here. These are a great little gift for babies. They are made of medical grade silicone, are easy to garb and are great to gnaw on. Shop here. Babies hit a stage where they love to put things in and take things out (this often involves your toilet) so toys like this have a long shelf life. Squishy and fun when they are wee, and in and out good times when they are older. Shop here. Babies love little flip books and these cloth versions allow for some serious mangling ; ) Shop here. They things are indestructible and won’t hurt if your baby clocks you (or herself) in the head with it. Babies love these things and they aren’t crazy expensive. Shop here. It covers the bath spout so they don’t knock their little noggins on the faucet. I had one. It rocked. Shop here. These are the best damn dolls. Despite being all fancy and French, they are the perfect size and, because the body is soft, they are extremely loveable. I bought one of these for my friend’s daughter and she hauls it everywhere. Shop here. Somebody bought my son these as a gift and both the boys still play with them. They are nice and soft so they are good to just roll around until you can stack. They can just be put back in the bucket (the all go through that crazy put-it-in-something stage. Best of all they don’t hurt if you step on the (I’m looking at you Lego) or fall on them. Shop here. 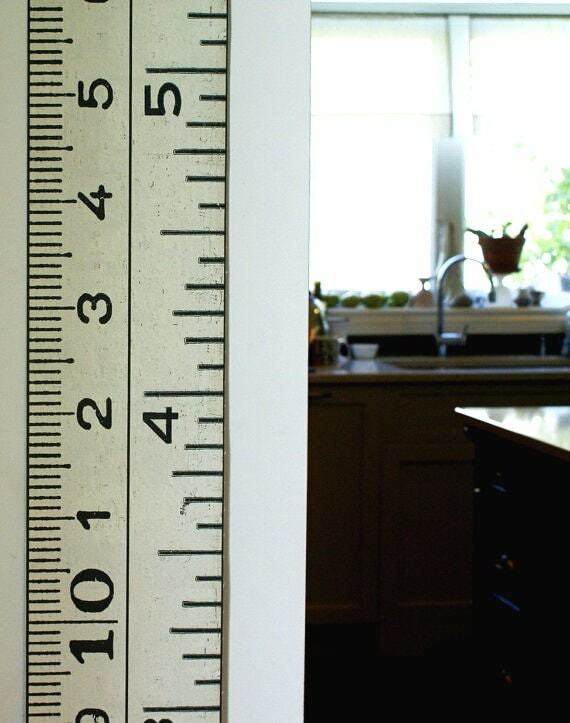 Growth chart that can stay up after they have outgrown fairies but haven’t outgrown *growing*. Shop here. I love these little boats for kids of all ages. And since they don’t have a hole in them you don’t have to worry about black mildew water being squirted in your face by a fun-loving toddler. Shop here. This a cd you didn’t know you wanted. But you do. The Rockabye Baby collection is surprisingly great — I bet you had no idea Tool would so so great as a lullaby. If you don’t believe me, check out the Amazon reviews! Shop here. All babies should have leg warmers. 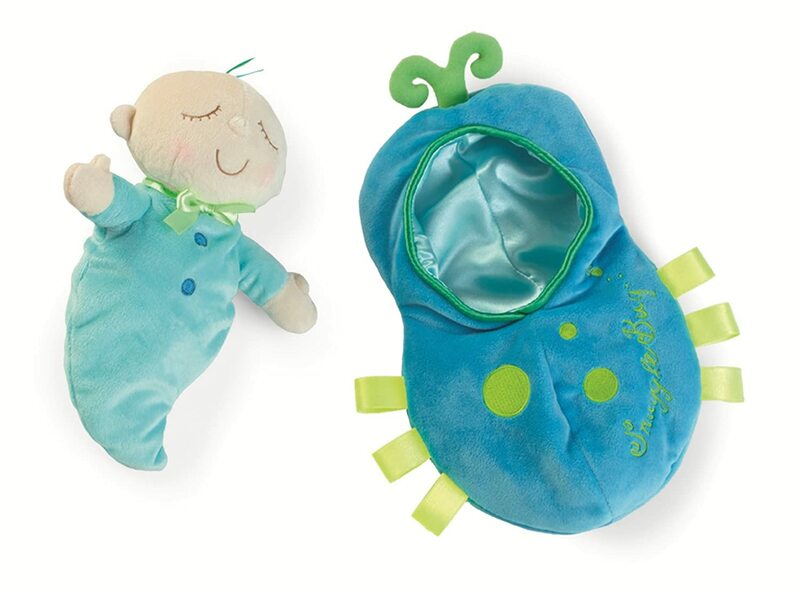 These are newborn sized, but BabyLegs makes them for preemies and bigger babies, as well. There are also a ton of other brands selling similar items. Shop here. You really can’t beat these for the price. 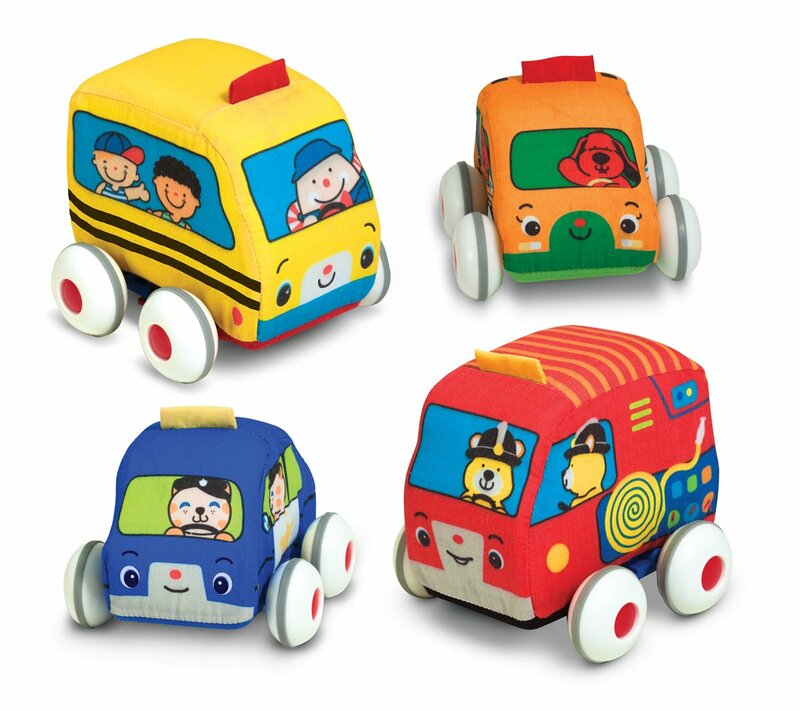 Each set comes with four safe, soft, and washable cars. They roll surprisingly far, even on carpet. Shop here. This is a great exploratory toy for little ones. Each fish scale has a different texture and lifts up to show a drawing. 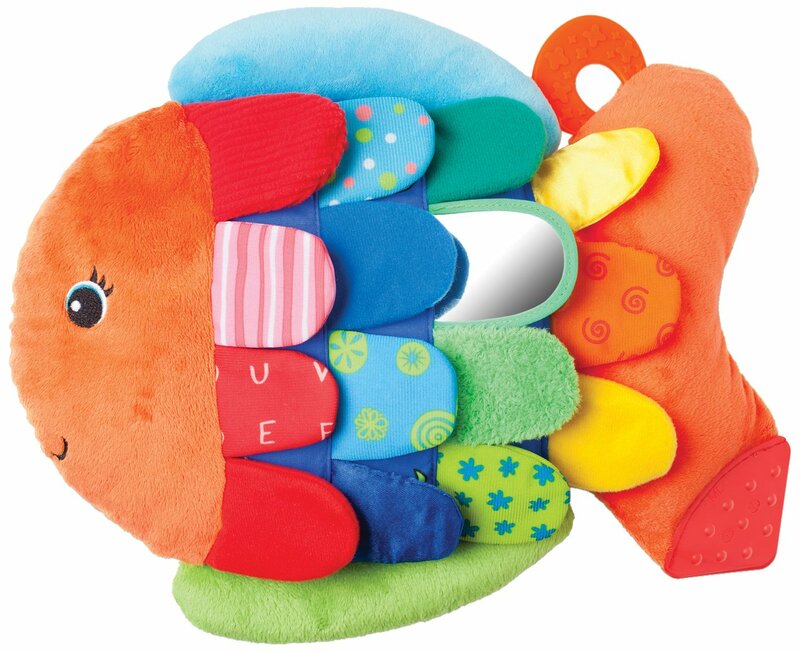 It also has a teether corner and is plush, crinkly, and huggable. Shop here. You get a little stuffed chick, certificate, card, etc. too. There are all kinds of animals you can adopt so it could be cool if a particular animal had special meaning. You can even adopt a raccoon (WTF?!) Shop here. Some of the gifts you can donate here are really incredible and truly life changing. You can even sponsor a child the same age as yours. Shop here. Get ’em in the water and swimming early. Great list, thank you. I actually did get some good ideas to use for my new grandaughter. I’m glad to hear that it helped! My nephew is turning 4 this Tuesday, I’m going to buy him something which he can used to go out and play. He already has a cycle and a scooter and almost all types of toys. Maybe I’ll gift him Aquarium Membership so that we both can go together and explore the beauty of Fishes. We got few things from your list for our twins – The Activity Gym and Music Table. Educational toys are the best. I was also surprised that Ikea makes toys for kids, I bought few and I must say they are awesome, especially the wooden stack-up toy and wooden cars. Such a super-helpful list! I’ve shared it to a mommy group on Facebook and I know it’s going to get lots of views and will be incredibly useful – I’m already looking at a bunch of the ideas. What a FANTASTIC list. This made my life so easy – I know just what to ask for this holiday. Thank you! Having a hard time opening the link, is it still available?